Venus Alexander climbs the steps to her new home with one hand on each of the sturdy wooden rails. Her gait is steady and slow; weariness, pain and determination mark this moment, as she achieves the life goal of home ownership. It was a long time coming. She is 62, and the years weigh heavily on her. Clydette Overton, right, of Zion Grove Disciples Church, leads a prayer of dedication for the home of Venus Alexander, second from left. At left is Greg Kirkpatrick, executive director of Habitat for Humanity North Carolina. The little house on Road Street in Columbia will soon be hers. It is modest. A single story, a wooden porch, a metal roof freshly painted deep green. Across Road Street on a bright and unseasonably cool August day is the bustle and hum of Capt. Neill’s Seafood packaging warehouse, in a squat, expansive cinderblock building. But Venus pays that no mind; inside her new home all is bright and new, with freshly painted walls and a modern kitchen. 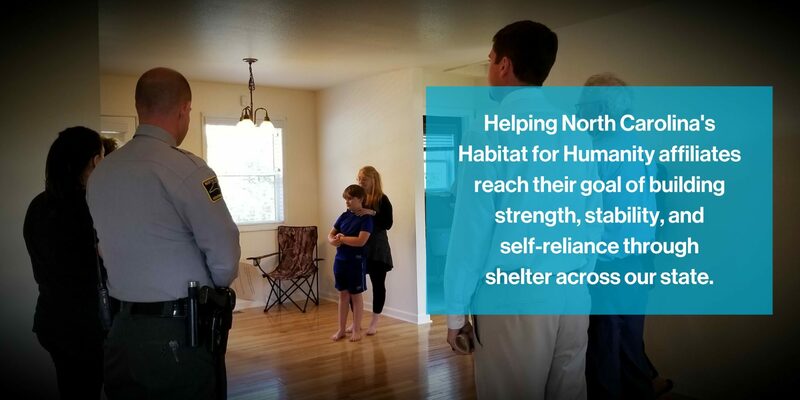 Two bedrooms, two baths; it’s all she needs and more than she might have hoped for if Habitat for Humanity North Carolina, the State Employees Credit Union Foundation, and John Crail had not stepped up. Crail is the skill and muscle behind the renovation, the man who offered leadership to the group of volunteers and Venus as they transformed a derelict house into a tidy and inviting home. 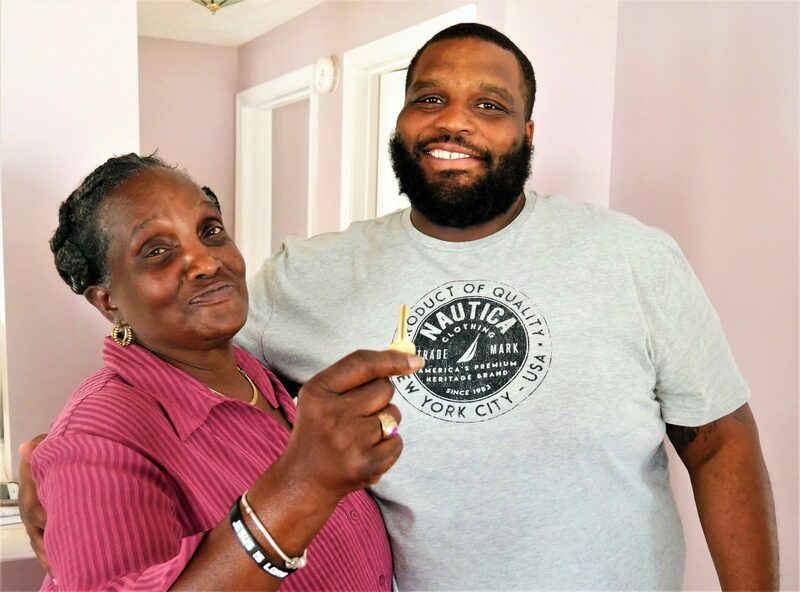 This cozy home will provide stability and a strong foundation for a woman who had been living in a rented trailer that was, in Venus’ words, “getting old.” The SECU Foundation provided the mortgage at zero-percent interest. And Habitat lent the expertise in finding the house and making it a home. It’s a day to celebrate, and Venus’ friends have gathered on the porch. They greet one another with the familiarity of folks who have lived long lives together. And they form a community that many might envy; impoverished but strong. They look out for one another; a bond formed out of tradition, necessity and spirit. This community comes naturally to Venus. Words, however, do not. When questioned, she responds with hesitation; as one who has not been given many opportunities for retrospection. Her life has been one of service; for the past two decades she has cared for people in their homes. Currently she sees two clients, seven days a week. She has lived her life in Tyrrell County; in the 2010 Census, the population was 4,407, the lowest of any county in North Carolina. Columbia, the county seat, was established at Elizabethtown in 1793 and is perched on the banks of the placid and majestic Scuppernong River. Like many of the historic Colonial towns of eastern North Carolina, it never grew much; today it is home to about 900 souls. And, judging from the scene at Venus’ home dedication, they all know one another. Venus’ home is part of the SECU Foundation’s Mountains-to-the-Sea Challenge, a $10 million partnership with Habitat for Humanity N.C. to build or renovate a home in each of North Carolina’s 100 counties. Once the homeowner assumes a zero-percent interest loan from SECU, the money is returned to the Habitat affiliate so that another home can be built. Venus Alexander, with her son Omar, shows off the key to her new home. The house in Columbia is part of the SECU Foundation’s Mountains-to-the-Sea Challenge, in conjunction with Habitat for Humanity North Carolina, to build or renovate a home in each of North Carolina’s 100 counties. “I hope this house gives you a lot of joy and I hope your friends come over a lot,” says Greg Kirkpatrick, executive director of Habitat N.C.